I remember the feelings of absolute shock the first time I heard the Express. I had prepared myself for a mediocre mélange of rough original pieces, and shoddy covers. However what I experienced was something much greater than that. What I experienced was a tight, well-rehearsed group that rides on a certain level of energy and joy that I was not expecting in the least. My feelings of initial shock however, quickly transformed into something akin to obsession. I put all of my other musical interests on hold, scouring the FBI tapes archive for any mention of the Jonestown Express. In fact, for a week I imagine my family and friends must have found my antics quite odd; I would often retreat to my room in order to listen to incredibly rough (sometimes almost unlistenable) recordings. However, I suppose that the Express accomplished my goal of finding the perfect humanity that I was positive lay somewhere within the treasure trove of tapes housed by the Jonestown Institute. Though my findings regarding the Jonestown Express are slim, and what information I have found seems to offer more questions than answers, I wish to impart what little I have learned. 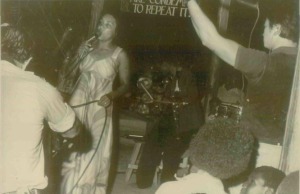 The Jonestown Express could be described as a fairly standard R&B/Soul outfit, consisting of all of the instruments that could be expected of such a group. There are guitars, basses, drums and saxophones. What really sets it apart from the rest, however, are the absolutely outstanding vocals provided by Deanna Wilkinson. She was certainly the main vocalist of the group, although sisters Marthea and Shirley Hicks often performed with the Express in lieu of Wilkinson (it seems the lineup was in a state of constant evolution.) The Express would meet and practice at the pavilion at the center of the community, right across from the radio room. Because of this, members of the Jonestown Express would occasionally ask staffers of the radio room to record the band’s performances in order to be heard later. One of the more impressive things about the Jonestown Express was its fairly expansive repertoire. They covered everything from the Beatles’ I’ve Just Seen A Face and the Jackson 5’s Keep On Dancing – both on Q174 – to a number of original songs. It seems that although the music of the Express has been preserved on some of the FBI tapes taken from Jonestown, the Jonestown Express is not present outside a few select tapes, usually lone recordings of the band, indicating that the Express was far from omnipresent within the community. Though the Express was certainly not at the forefront of life at Jonestown, it served as an important outlet for the musically inclined members of the community, allowing the words of Jim Jones to be put to music as well as to provide entertainment for the community and high-profile guests such as Congressman Leo Ryan. Despite the fact that there isn’t much recorded evidence of the Jonestown Express, it is forever captured in one of the finest pieces of audio/video that remains from the Jonestown community. Ryan went to Jonestown accompanied by an NBC film crew; intent on capturing what, at the time could only be described as an incredibly important story. What they certainly couldn’t know, of course, was that they were capturing the final performance of the Jonestown Express as well as the final night of most of the people present in that pavilion. I am always struck by the amount that I have been captivated by the Jonestown Express and all of the other voices that I have heard on countless tapes, videos and written testimonies. Though many of those voices perished in the most tragic of circumstances, I find some solace in the fact that they will be preserved forever due to the efforts of everyone at the Jonestown Institute. The Jonestown Express has been an inspiration to me, and I hope that I can do my part to contribute the truths to others that I have found within the tragedy that was Jonestown, and help shed light on the life, love and laughter that existed in the lives of those who lived and laughed in Jonestown before their tragic ends. Originally posted on October 12th, 2014.